Forget politics, religion, sports or movies. 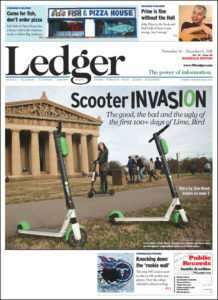 If you want to start an argument in Nashville these days, bring up “shared urban mobility devices” – aka scooters. 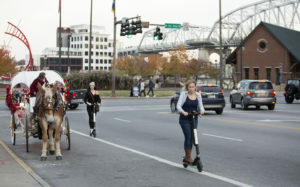 Everyone has an opinion on their future in Music City and their role in Nashville’s burgeoning transportation problems. Fans love riding scooters, and foes hate dodging them, but we’re all dealing with them. The dockless, electric vehicles reach speeds up to 15-18 mph, and can be ridden or parked anywhere – including sidewalks, parks, loading zones outside businesses. Scooter operators Bird and Lime each boast 1,000-unit fleets here, which some see as part of the problem, not the solution. District 26 Councilman Jeremy Elrod, who co-sponsored Metro legislation to put scooters on the streets, knows there are problems but sees upsides: They’re a cheap way to get around downtown, could help cut down on carbon emissions and relieve traffic congestion. All pro football players wear them for safety to hopefully prevent traumatic brain injury. It’s a subject of scrutiny by the NFL and medical community. All scooter riders should, but very few do. In Tennessee, I learned, people who ride scooters are not legally required to ride helmets, but are urged to by many. The scooter operators will give free helmets to anyone who requests one. A big chunk of my article on scooters focuses on the medical issues, and I talked with VUMC trauma surgeon Dr. Oscar Gillamondegui about scooter injuries he’s seen. Guillamondegui says helmet-wearing can’t happen fast enough to avert the current “perfect storm” for traumatic brain injuries. He also recommends knee and elbow pads for scooter riders. Much the same can be said about riding a scooter. At some point, if you ride them often enough, you’re going to take a spill. How bad depends on speed and circumstances — and protection. It reminds me of what a sports writer wag once laughingly told me about the short-lived professional boxing career of NFL star Ed ‘Too Tall’ Jones. Ed played college football at Tennessee State University and then for the Dallas Cowboys before deciding to switch to pro boxing. He went 6-0 as a pro with five knockouts before deciding to return to the Cowboys. “He didn’t like getting hit without a helmet,” was one of the comments I recall. Eat Like a Titan … Go Vegan! Charity Morgan is out to change the world, one meal at a time. That’s the takeaway I got after spending a half-hour talking to the Nashville-based chef for an interview in the Nashville Ledger. Hey, if it’s good enough for the Tennessee Titans …. Morgan is a vegan, plant-based chef who has big plans for 2019, including the possibility of opening a restaurant. She currently feeds husband Derrick Morgan and more than a dozen of his Titans teammates, and that occupies all her time. But after this season ends, watch for big events from Morgan. To read the complete article online, click here. 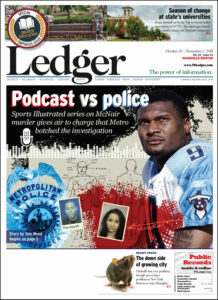 You can pick up the a copy of the Ledger at Nashville area locations now through Thursday, Nov. 29. Then, I’ve got another story coming out in the Ledger, which I will post here as soon as it’s available online. It’s an in-depth look at the electric scooter craze in Nashville. Weighing in are medical experts, legislators, the police and everyday folks. Be sure and check it out. I’m a third of the way through the Sports Illustrated nine-week narrative podcast ‘Fall of a Titan: The Steve McNair Story‘ and the fourth episode drops on Wednesday, Nov. 7. 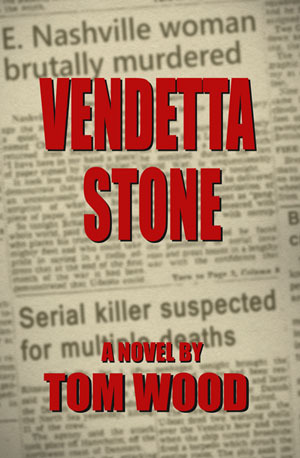 It’s worth a listen, whether you’re a Titans fan, a McNair fan, or (like me these days) a mystery / suspense / thriller writer. inclined to agree with the police assessment, based on what I’ve heard so far. There has been speculation, with a mix of tawdry gossip, and I’m assuming we’ll learn more along the way. in staying true to the mission of being a skeptical journalist. I, too, am skeptical – of a lot of things Tim has so far presented. When the podcast is over, I hope for one of two things to happen – that he has presented enough new evidence so that police will reopen the investigation, or that the podcast comes to the conclusion that the police assessment was correct, and everyone will finally let the McNair story rest in peace.